To help decide what happens the GM uses the rules of the game. While the players don’t need to know the rules in order to play and enjoy the game, you must be familiar with most of them. Don’t commit the entire book to memory, but you should at least know where to find the rules for any given situation. You decide whether a dice roll is necessary, which test to use (see Standard Tests below), and what the precise results of a successful or unsuccessful test will be. 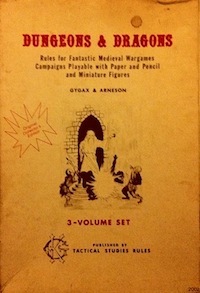 Mostly, though, you must rely on your imagination and common sense; the test of a good GM is not whether the rules can be recited from start to finish without looking anything up, but whether situations that may not be fully covered in the rules are dealt with in a consistent and realistic fashion. After all, in a fantasy game the Impossible happens quite regularly, and no set of rules, however large and complex, can hope to cover every possible eventuality. Warhammer Fantasy Roleplay first edition, page 63. I love that it says the players don’t need to know the rules in order to play or enjoy the game. The player’s interface is assumed to just be naturalistic. No need to think about bonuses or builds or really anything other than what could be described diegetically. There’s this stuff, and these things happen, what do you do? This is so different from the system mastery assumptions many games make now. It also helps that most of character generation is random (though there are some parenthetical notes about advanced players being able to choose careers). That test for what makes a good ref is also right on. Not rules memorization, but rather flexibility and skill when adjudicating the parts of the game that are not spelled out clearly (because there will always be parts that are not handled clearly by the rules). I might add organization and note taking to the skills a good referee must possess, but that is a different topic. Reading this rulebook is my first real exposure to Warhammer, and so far I’m really enjoying it. The art is fantastic. All the percentile dice feel like overkill, but I could probably get used to them. When I played in the 90s, the heavy use of miniatures turned me off, though even back then it had a “metal” reputation (though I’m not sure I would have considered that an unalloyed good back then; my taste was more serious and less gonzo). It is true there is some miniature shilling in the book (along with some full color photo plates of Games Workshop miniatures) but the rest of the book is so good I think I can overlook that. This entry was posted in Uncategorized and tagged revisitation, Warhammer on May 4, 2012 by Necropraxis. In the DMG, even Gygax shills TSR’s miniatures. I’ll never get over his implication that only TSR miniatures are ‘compatible’ with D&D. My note taking skills are terrible. I’ve gotten by all these years relying on an above average memory, but I really ought to learn this skill. Do you have any posts on that topic, or if you do not, would you write one? I’m still working on this myself. I find it very difficult to take many notes during play, especially with my current groups which is rather large (5-7 players, sometimes with several other observers too). And I have a terrible short term memory. I have found two techniques that help. One is to make a point-form list of what happened in every session, the sooner written down the better. The other thing is to have a few categories of things that you record per session, and make sure to always note those. I’ve seen some session record sheets on the web that offer some inspiration here, but I don’t have anything really good to point to right now. This would definitely be a good topic for a future post. I’ll try to collect my ideas and put something together. WHFRP is great. You are dead on about the art, and I will add that it is consistent in the supplements. Of course, WHFRP was my first love before D&D and it was our primary game for a long time. Unfortunately the supplements seem to be rare and pricey. Quick question about switching careers in first edition Warhammer: do you have to complete all the advances in one career before you can switch, or can you switch at any time? The book seems to suggest you need to finish one before moving on, but it was not entirely clear to me. And can you switch back to a previous career? That would essentially allow you to progress in any number of careers at the same time, and I can understand why one might not want to allow or encourage that. If I remember rightly you can switch out of basic career into another basic career at any time, even into a non-related field, but you have to finish a basic career to move into an advanced career. So, for instance you must complete the entirety of mercenary to move into mercenary sergeant. My understanding is that you can return to old careers, such as mercenary to soldier back to mercenary, but you can only progress in one career at a time. An ex-soldier cannot progress as a soldier whilst a mercenary, for example. Of course, you cannot change careers “willy nilly”, if you want to move from “freelance” to “templar” you will need to find an organisation of templars that will have you (an example of just such an event occurs as a reward at the beginning of Empire in Flames, as I recall)! Since switching careers costs XP (100 IIRC), changing them too often wastes experience. So there doesn’t need to be a restriction on doing it too often. As to not knowing the rules, I ran a fun campaign of Fantasy Hero, arguably one of the most complicated games ever, with some total RPG newbies and it worked great. It was easy for the players because, in that game, no matter what your character tries to do, you will roll 3d6. That game really taught me to appreciate a unified core mechanic. I wonder if there is an argument to be made that unified mechanics are worthwhile as part of the player interface, but less valuable for the referee. Like, d20 actually handles most player resolution tasks pretty well, but the ref side needs other probability curves sometimes. I guess Traveller does everything with 2d6 right? So maybe 2d6 or 3d6 could actually handle everything.